I've been feeling restless because my assistant hasn't been baking as often as she--and certainly I--would like. But just before I started feeling all pouty and insecure (why, oh why, is she neglecting me? 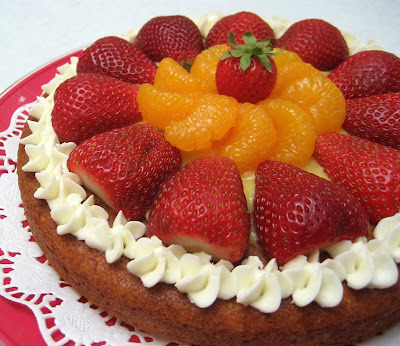 ), she made a trip home out of the San Francisco midsummer fog to sunny Los Angeles and felt compelled to whip up a light, fruit-topped cake to share with her loved ones. 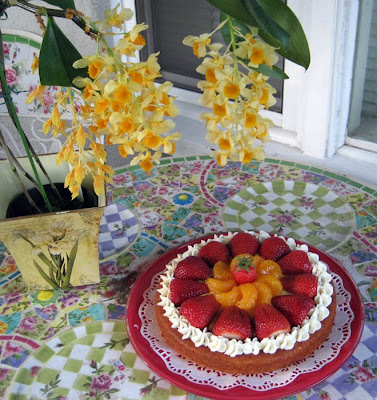 Some summertime sunshine and two hungry, younger cousins--Nathan and Alan (whom she's happily baked for before)--were all it took to get my assistant back into the kitchen and me happily back to work. 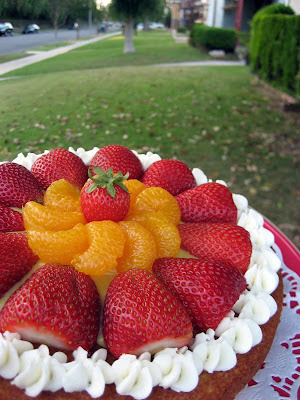 Chiffon-like vanilla cake topped with rich, french vanilla pastry cream, a border of vanilla-infused whipped cream swirls, fresh strawberry halves, and juicy mandarin orange slices--this cake was as light and refreshing as a cool breeze on a hot summer day. And it's not bad to look at either.